Lately I've gone through, yet again, another period of blogging 'doldrums,' If you blog, you know exactly of that which I speak. It is a time of intense self-doubt about the whole meaning and reasoning of blogging. At it's worst, the blog is in a hormonal mid-life crisis. Urges to hit the delete button and selfishly take the ball home so no one else can play, aren't uncommon. It ain't the right thing to do, but it is a thought every honest blogger admits to having, on occasion. Sometimes blogging is easy. At other times, it feels like work or being stuck in quicksand. Quitting seems less painful. 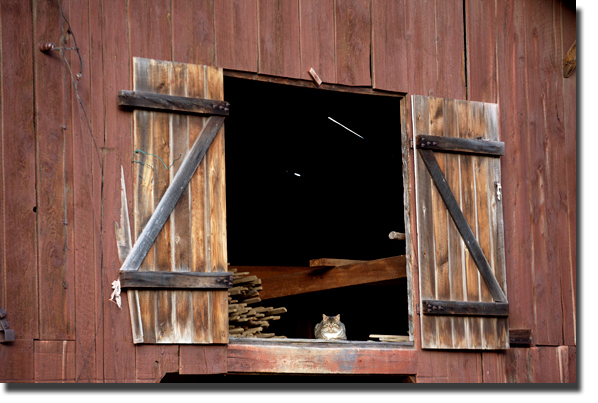 But then, all the sudden, something as simple as a cat watching Valle Crucis life pass by from the second floor of tobacco barn makes the whole blog ticker tock again and we bloggers resume as if nothing was amiss in the first place . I'm not sure I can explain it any better than that.